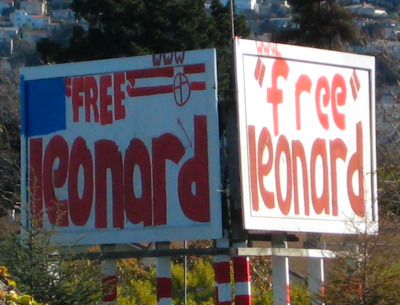 You see, it might seem like a free leonard now, but then you have to feed him, and pay for a sitter when you're out of town... the costs add up. Thanks, Elise. The Leonard referred to here is Leonard Peltier, who some believe was falsely convicted of various charges because FBI agents lied under oath n stuff like that. So they are proposing limited freedom? Maybe house arrest for the next twenty years. Greg, perhaps it's politi-speak, you know where you try to please all the people.... That way they can claim to be for freeing the guy to the people that want that, and ALSO be for keeping him on the ankle bracelet. I wouldn't have him even at a discount. You can release him from prison, but people will still believe he's guilty, like with O.J. Simpson. In that sense, he will never be free. Regardless of politi-speak, I LOVE Bethany's comments on this one. How DO you do it? !